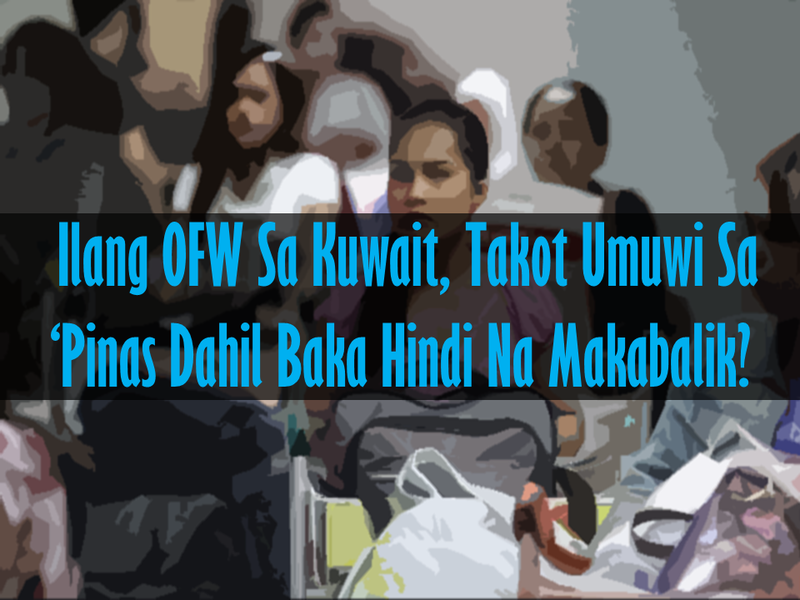 THOUGHTSKOTO Thoughtskoto : Why OFWs From Kuwait Afraid Of Coming Home? As overseas Filipino workers who sacrificed a lot to give our kids all the things they deserve like sending them to school, attending our kid's graduation is considered a bliss knowing that your sacrifices move one step ahead. But for a nurse in Kuwait who had been working there for ten years, the excitement is clouded by the fear that she might not be allowed to return to Kuwait should she take chances of attending the graduation of her three kids this coming June 2018. President Duterte declared permanent deployment ban of OFWs to Kuwait recently amid the diplomatic row between the two countries sprouted from cases of abuse among OFWs there. There are about 250,000 OFWs in Kuwait not including the undocumented workers. Most documented workers in the Gulf state are now skeptical on whether they can return to Kuwait should they go home for a vacation because of President Duterte's statement to make the deployment ban of OFWs to Kuwait permanent. The negotiations that would possibly iron things out between the two countries was about to be signed when something went wrong. The Kuwait government wanted to expel the Philippine ambassador declaring him a persona non-grata because of the video of a rescue mission that went viral on social media. The Kuwait authorities claimed that the rescue was not properly coordinated with them and that the embassy officials were making itself a state within a state bypassing the sovereignty of their country. Although DFA Secretary Allan Peter Cayetano denied the allegations several times saying that their every move is properly coordinated with the authorities. He even apologized to the Kuwait government for what had happened. In spite of all these, Philippine ambassador to Kuwait Renato Pedro Villa was still sent out of the country. In spite of the President calling out to every OFWs to come home, there are nearly none that seems to heed his call. It's either they are afraid that they could not come back or they really need to earn more because they are the only breadwinner of their family. However, the Kuwait authorities said that they are open to any resolution that will end the diplomatic row between the two countries.